FILE PHOTO: U.S. Ambassador to the United Nations Nikki Haley delivers remarks at a security council meeting at U.N. headquarters during the United Nations General Assembly in New York City, U.S. September 21, 2017. ADDIS ABABA - U.S. Ambassador to the United Nations Nikki Haley arrived in Ethiopia on Monday, among the first visits to Africa by a senior member of President Donald Trump’s administration that diplomats hope will shed light on his plans to engage with the continent. While Africa is traditionally overshadowed by more urgent issues, the Trump administration has so far been hands-off. “The president is sending me because we want to build (our Africa policy) back up to what it was under (President George W. Bush); it has fallen and our African friends feel that,” Haley told a George W. Bush Institute event in New York on Thursday. Trump has been vocal about North Korea, Iran and tackling Islamic State militants during his first nine months in office, but said little about Africa until he held a lunch last month with nine leaders on the sidelines of the U.N. General Assembly. It was there he announced he would send Haley to South Sudan and Democratic Republic of Congo to help with efforts to broker peace in both countries, where millions of people have been displaced by ongoing violence and U.N. peacekeeping missions, each costing more than $1 billion annually, are deployed. Haley wrote in an opinion piece published by CNN on Saturday that she would take a critical look at the U.N. operations. Some African diplomats hope Haley’s trip will spark a conversation in Washington on the administration’s broader engagement with Africa. Haley’s visit to Africa comes after four U.S. soldiers were killed during an Oct. 4 ambush in Niger. “The Niger crisis has shown that they can’t take a hands-off approach to (Africa). They have to remain engaged because they have boots on the ground,” said a second senior African diplomat at the United Nations, also speaking on condition of anonymity. At his lunch with African leaders, Trump said there was “tremendous business potential” and he has friends “trying to get rich” in Africa. But he also noted the threat from militants such as Islamic State, al-Shabaab, Boko Haram and al Qaeda. However, in June the United States said it did not want the United Nations to fund a proposed African force to fight Islamist militants in West Africa, U.N. diplomats said. France on Friday pushed Washington to step up support for the force so it doesn’t fail, leaving French troops to carry the burden. 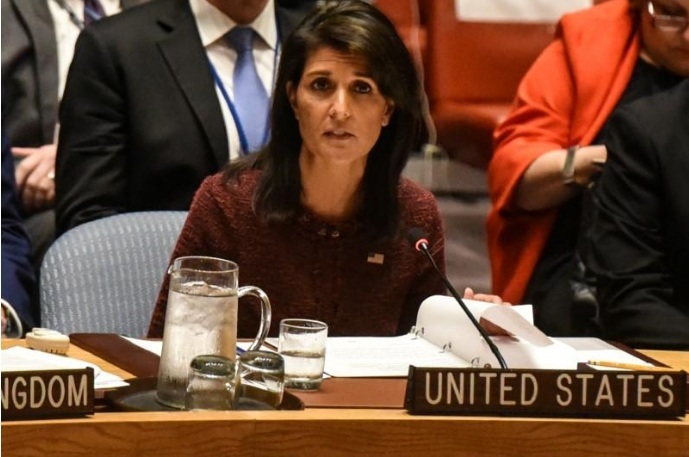 Haley has been campaigning to cut U.N. peacekeeping costs as the United States is the largest contributor. “Throughout the world, we have seen that desperate situations can lead to dangerous results. For this reason, President Donald Trump recently asked me to travel to the region to get a first-hand picture of what can be done,” Haley wrote on Saturday. As with most of the key regional bureaus at the U.S. State Department, there is currently no permanent chief diplomat for Africa. Rather, the Bureau of African Affairs is led by career diplomat Don Yamamoto as an acting assistant secretary of state. While Yamamoto is an experienced Africa hand, diplomats say that leading any of the agency’s regional bureaus in an acting capacity means that an official is not perceived abroad as having the full backing of the White House and has more limited influence at home within the U.S. bureaucracy. “They seem to be relying very heavily on their ambassadors on the ground and not having a Washington-centric approach to their relationship with Africa,” said the second diplomat. In August Haley’s colleague in Trump’s cabinet, U.S. Trade Representative Robert Lighthizer, traveled to the West African nation of Togo to review a free trade pact with sub-Saharan Africa, but talks ended with no decision. U.S. Ambassador to the United Nations Nikki Haley arrived in Ethiopia on Monday, among the first visits to Africa by a senior member of President Donald Trump’s administration that diplomats hope will shed light on his plans to engage with the continent.